Please refer to our stock # 691 when inquiring. 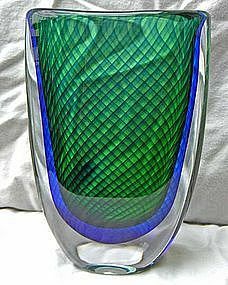 Heavy and substantial art glass vase designed by Vicke Lindstrand for Kosta. c. 1950's. Stands app. 8 3/4" tall by 6" wide. Condition - very good with no damages observed.